CEM KANER, JD, PhD, is a professor of computer sciences at Florida Institute of Technology. He also consults on technical and management issues, and practices law within the software development community. He is the lead author of two books, Testing Computer Software and Bad Software (both from Wiley). JAMES BACH is founder and principal consultant of Satisfice, Inc., a software testing and quality assurance company. His experience with competitive software development in leading Silicon Valley companies, such as Apple and Borland, led him to specialize in such aspects of the craft as "good enough" quality, risk-based testing, exploratory testing, and other techniques that require skill and judgment. He has also served as Chief Scientist at Software Testing Labs. BRET PETTICHORD works as an independent consultant and edits the popular Software Testing Hotlist at www.testinghotlist.com. A frequent speaker and writer, he is also the founder of the Austin Workshop on Test Automation. The Role of the Tester. Your Career in Software Testing. 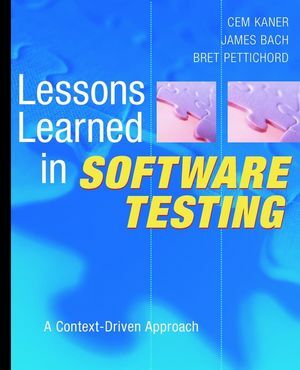 Appendix: The Context-Driven Approach to Software Testing.